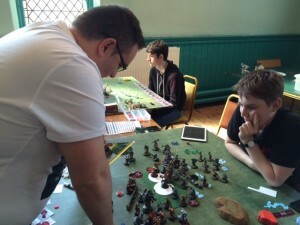 As you may or may not know the Warlords of Walsall hosted a Masters style event this past Saturday (18th April) at our club venue. Our WMH events have always attracted good numbers and we hoped to improve upon those by increasing our usual attendance cap to 32 people. This allowed us to split it into 2 concurrent tournaments of 16 players and also that’s about as many as we can comfortably fit in the hall. Any more people and it would be fairly snug. We managed to get 25 on the day, which broke down into two flights of 12 and 13, which was a good turn out. Each player that attended also received a free 4×1 widget as a gesture of thanks from the club made by Counter Attack Bases. Hopefully everyone who attended enjoyed the day and we are always looking to improve so if you are reading this and have some feedback then please let me know. In the future we will hopefully have a few extra pieces of terrain like trenches and some shallow water just to spice things up a bit as well, but enough of that and let’s get into the actual tournaments! Rich (our President and resident Pressganger) was in charge of running both events and did a great job of making sure things ran smoothly. All 4 of my games were very tough and I didn’t get much room to breathe in between rounds because of how long my games were so having the pairings up ready to go shortly afterwards was fantastic. Thanks to Rich for running another great event at the club! SPOILER – Don’t look at the results… you did didn’t you? The scenario was Outflank and I dropped Jarl against Siege. This was a more melee oriented Siege list than I am used to and the tempo of the game was very different. I did manage to clear one of the zones to dominate and then the other zone the turn after to get my 5 points for a scenario win. It was a tough game with Warders flying off the table faster than I could say ‘tough roll’, but in the end the armour proved a bit too much I think for Siege. Hard-hitting infantry under Siege’s feat put a huge dent in Warders. I’ve come to expect a more ranged focused Siege list which is why I looked at Jarl in the first place and the melee threats threw me off a bit. Tempest Blazers are ridiculously good. This isn’t a new thing I’ve learned, but it’s worth repeating. The scenario was Destruction and the game ended up being Fist of Halaak vs my Jarl list. I had to drop Jarl as I’m not sure Grim could get through all the boxes of Fist before it engaged me. 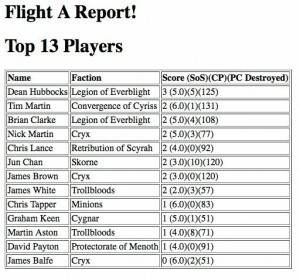 I had played Paul before in the final of one of the Powerfists Steamrollers before Christmas. I was playing Bradigus back then and snatched defeat from the jaws of victory with a misjudged assassination run. This time I was expecting a real grind of a game, and that’s what happened. At the end both of us were below 10 minutes on the clock and I was running out of time faster than he was. I made a decision to just shoot Xerxes with Jarl until either he died or I did because I wasn’t going to clear the Cetrati out of the zone. It took a few turns, but thanks to Evasive I was able to walk around any models that tried to engage me and get my shots off into Xerxes to narrowly win the game with around 3 minutes left on my clock. This was an unbelievably tough game, almost 2 hours of concentration and afterwards we were both exhausted. I had half an hour to get some lunch before I had to do it again in round 3. I didn’t think about this until a few days after the game, but it’s possible to use Tectonic Shift from Janissa to break up the shield wall on the Cetrati, which hopefully will give the Warders the edge in that attrition fight provided I can keep Janissa safe. Evasive is very useful when its useful. The ability to boost hit and damage on 2 POW12 pistols when I can’t be targeting by free strikes is great, I must try it more often to threaten opposing Warlocks/Warcasters. I need to protect Mulg until he can commit safely into the Cetrati. I killed his Bronzeback in this game and then lost him to Acurarii, I’m not sure if that was a good trade or not in the end. Looks like another game where I have to use Jarl! I think I spoke briefly about my thoughts on Grim vs Menoth and it’s not a good for Grim. 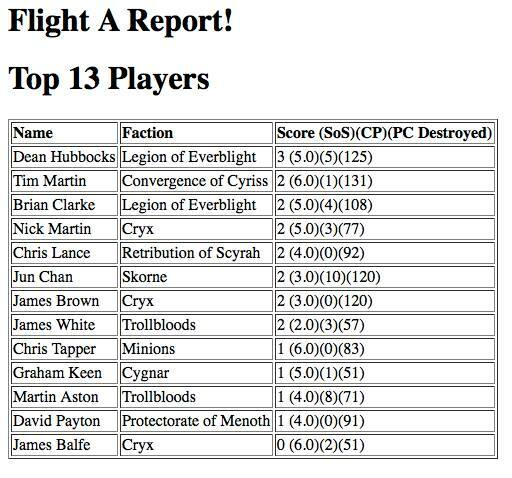 I have played a few games vs Rich using either High Reclaimer, Feora or Harby and it can be a real struggle depending on what’s in the list and Dan had eFeora as his second list which would put the hurt on all the trolls Grim brings. So it ended up Jarl vs Harby in Close Quarters. I knew this would be a tough game made tougher if I wasn’t careful of Harbinger committing to her flag and keeping me at bay using her Bastions as a screen and abusing martyrdom. I deployed my Long Riders opposite her flag in an effort to have something fast enough to run around the bastions and contest if I needed to. I would also have to leverage Jarl’s pistol shots to try to keep Harbinger under pressure if she wanted to use martyrdom. Dan was very aggressive with his turns and used his errants to pin me back while his bastions got into position behind them to protect his flag. I managed to use my feat to deny the bastions the charge on my warders and then we fought in the centre of the board for a while with the warders slowly getting the upper hand thanks to getting the charge. I had to run the Long Riders to contest his flag when he started to dominate it in round 3 and thankfully for me he spent most of his focus trying to clear out a long rider that a Reckoner couldn’t get to. This gave me the opportunity to shoot her with Jarl who was 16 inches away. I aimed with Far Strike and managed to kill her with my rune pistols. In terms of the tempo of the game I think my feat helps bring it back in my favour after the Harbinger feat that is usually predictably around turn 2. I can afford to pop my feat afterwards and then gain the upper hand on the infantry fight in the centre of the board. Awe is an issue, and so maybe I might put a Fell Caller into my specialists. I can then swap out Janissa if I don’t need her but I do need the +2 to hit buff from the Fell Caller. This puts me at 3 wins and into the final against either James Stark or Matt Townsend who were playing on the table behind me at the time. Matt managed to beat Jimmy and so I was playing against Skorne in the final, in what turned out to be a really good back and forth game. The scenario for the final game was Recon and I was locked into Hunters Grim. Knowing this Matt chose eMakeda, but had I had both lists available we both said we probably would have chosen our other list. 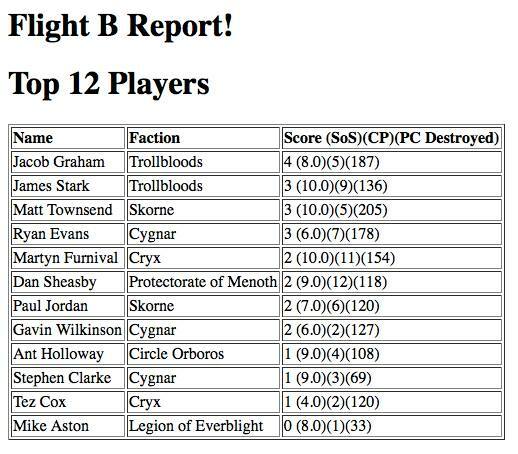 If I’m honest I wasn’t too confident about my ability to get through all the warbeasts in his list, but with some generous use of Mortality, Burrowers and CRA’s I might be able to get through enough. I knew I had to try to leverage the Burrowers as best I could on the turn they appear to help me do damage to the beasts, however I completely forgot to bring them back on the table the turn after they burrowed. I realised shortly after I completed my Mirage movement, but by then it was too late and I took the burrow token off the table and had a rethink. In short it involved killing the Nihilators thanks to Mortality and some Highwaymen, damaging Molik Karn quite severely with some Highwaymen CRA’a and some Slag Troll shots and passing the turn. Matt tried then to assassinate Grim by feating with Makeda and moving her up into the zone to make sure the Archidon will still be in her feat range for the boosted attack rolls. An enraged, puppet mastered, rushed Archidon flew right over my scattergunners into a wonderful 50mm shaped gap next to Grim. He hit with his charge which was transferred to a Storm Troll, then hit using puppet master to do around 7-8 damage and then missed his other attacks, so for now I was safe. His Bronzeback then took out over half of my Highwaymen and Molik took out some Scattergunners. I killed his Archidon in return with Grim using Acidic Touch, Charge of the Trolls and War Cry then tried again to kill Molik Karn but left him on a couple of points and corroded. I tried my luck on Makeda with some CRA’s from the Highwaymen that managed to hit and do around half of her health, result! I also charged in the last Fire Eater in the hopes he can set her on fire, but he missed. Next turn he moved Makeda away, healed some points on Molik and continued killing my infantry. The turn passed to me and I tried to shoot Molik yet again with a slag troll and he forced me to re-roll the dice and on his final fury I missed my boosted shot leaving Molik still alive. However, unknown to me this left all his beasts on full fury (I had somehow convinced myself that the Gladiator was fury 5 and so he could still transfer to it) and was trying to figure out how to get multiple hits on Makeda. I couldn’t think of a good way to do it (I should have just shot her with Grim and I might have killed her at that point. I can’t remember how many boxes she had left). Instead my plan was to free up the Storm Troll who was engaged by the Bronzeback and shoot the objective to electro leap into Makeda. The only thing I had capable of killing the Bronzeback was Grim himself and so as bad as this plan sounded I charged the Bronzback with Grim (who has Acidic Touch, War Cry and Charge of the Trolls on him) and left it on 3 HP so I had to use the Storm Troll to finish it off, leaving Makeda alive. Now in his turn both the Gladiator and Molik frenzied which was incredibly lucky for me. However I still had a damaged Grim in the zone with no transfers and so he tried again for an assassination. He cast Engine of Destruction on Makeda to move her far enough to get in range to cast a boosted Stranglehold at Grim that succeeded and did a few points of damage. The Extoller Soulward then took a boosted shot at Grim and I think did another couple of points. I was now down to around 5 boxes left with 3 models about to charge me. Two of those models were Pain Givers, they both charged in but failed to roll the 11s needed to hit me. 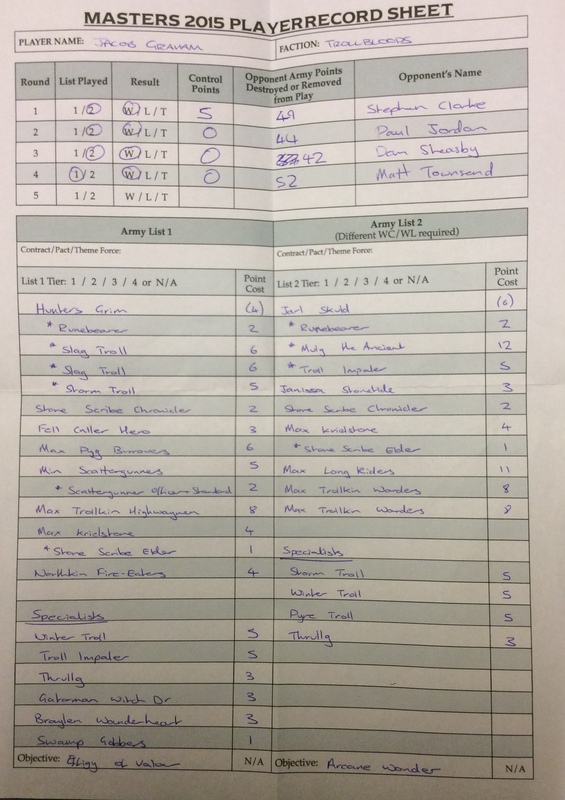 The last model to activate was the Tyrant Commander who only needed 8s to hit, so he charged in and both hit and killed Grim save for the tough roll. I picked up the dice and rolled it. 6. On his last attack I managed to pass my tough roll! I can’t believe my luck and I don’t think neither can anyone else who was watching the game at that time. It was then my turn and I killed the pain givers with the fell caller, killed the Tyrant Commander with the Storm Troll and after shaking the knockdown and forfeiting my movement for Stranglehold I shot Makeda and won the game! It is possible to get through multiple warbeasts with the list provided I use my boosted shots well enough and my CRA’s. I made some positioning errors, like leaving space for the Archidon on the feat turn, that I could have corrected had I took an extra second or two to think about them. 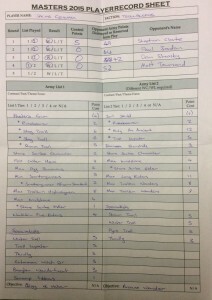 That was an incredible game of Warmachine to top off an incredible day of Warmachine. I hope everyone else had a great tournament and I’d like to say thanks to all my opponents for 4 great games across the day!